She-Crab Soup | What's Cooking at the Genua's? 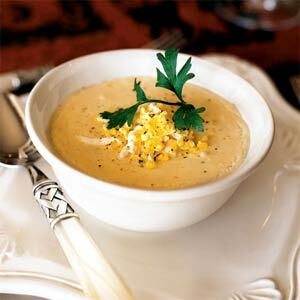 Keeping with the Charleston recipes today’s is She-Crab Soup. I have had this soup here in Florida and it was delicious. So creamy and rich and just plain scrumptious! It is not a low-calorie soup but you can lighten it up a bit by substituting some ingredients with their lighter counterparts. But for now I’m leaving the recipe as is. I won’t put in the calories I found on this either. No need. We know it’s high and we’ll leave it at that. Now what is a “she-crab” and why is it in a soup? The soup is a regional specialty from the South Carolina Lowcountry. It is considered to be the signature dish of Charleston, SC and is featured on the menus of many of the city’s restaurants. The soup is named for the “She-Crab”, or female crab, originally a gravid crab, heavy with the flavorful orange crab roe that is typically a main ingredient in traditional she-crab soup. You can leave the roe out of this recipe if you wish, nobody will know! I definitely plan on having this while on our little visit and I will be making a lighter version of my own when I get home. I looked through many recipes and formed my own version for this recipe. If you want to learn a little more on the history of She-Crab Soup, just click on the link for more information and another version of the recipe. I will add my substitutions after some ingredients. 1. Melt the butter in a large stockpot/dutch oven over medium heat. Stir in the flour to make a smooth paste (a roux) and cook for about 3 minutes, making sure you stir constantly! Stir in the onion and garlic and season with the salt and pepper. Continue cooking and stirring for about 4 more minutes. 2. Gradually whisk in the half-and-half making sure no lumps form. Stir in the chicken broth and heavy cream. Bring this to a simmer and pour in half of the sherry. Add the dill, Worcestershire sauce and hot sauce. Cover and simmer for about 30 minutes, until the soup has reduced by a third. Add the crabmeat (and roe if you decide to use it), stir carefully. Simmer for another 10 minutes stirring occasionally. 3. Serve the soup and top each bowl off with a splash of the rest of the sherry and a sprinkle of the scallions! I need to encourage one and all to eat healthy. We tend to all be anxious concerning so much. A healthy food plan can produce all the difference in the world.